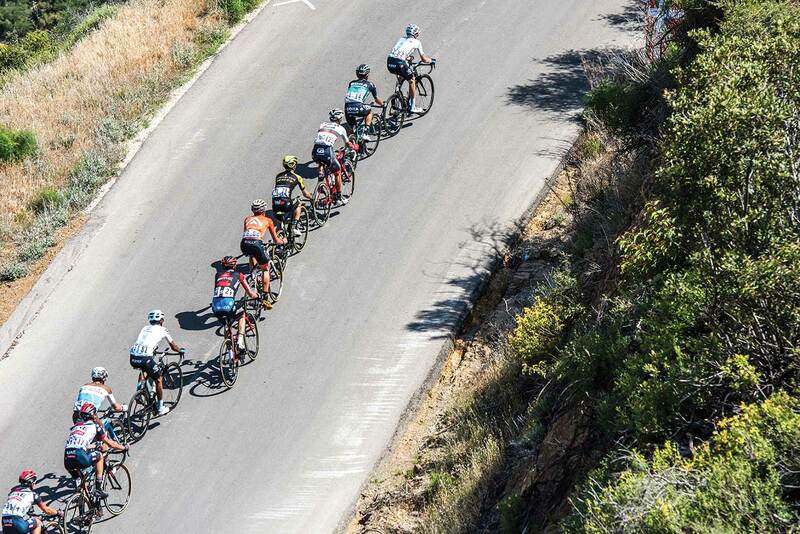 Team Sky riders employed their classic tactics to conquer the 13th Amgen Tour of California in May. On stage 2’s Gibraltar Road above Santa Barbara and then on stage 6’s Daggett Summit in the Sierra Nevada, workhorses Luke Rowe, Pavel Sivakov and Sebastián Henao blitzed the peloton going into those half-hour climbs before giving way to first lieutenant Tao Geoghegan Hart—who then upped the pace before setting up his team leader for winning attacks. In this case, that leader wasn’t Chris Froome or Geraint Thomas but Sky’s first-year Colombian climber, Egan Bernal. Bernal’s two dominant stage victories were more than enough for him to overcome the 83 seconds he conceded in the stage 4 time trial to 2013 California winner Tejay van Garderen—who ended the seven-day race in second place. When the definitive story of Egan Bernal’s career is written, perhaps in a decade or so, it will be hard to say when the world first took notice of this phenomenally talented athlete. Maybe it will be that sunny California afternoon on Friday, May 18, when Bernal stormed away from race leader van Garderen on the relentless climb to Daggett Summit. Maybe it will be three Fridays before that, on stage 3 of Switzerland’s Tour de Romandie, when he out-paced two other seasoned WorldTour riders, Primoz Roglic and Richie Porte, to win a 9.9-kilometer uphill time trial to the alpine ski resort of Villars. Or maybe it will be the humid Sunday afternoon of February 11 in his native Colombia, when Bernal’s attack with Sky teammate Henao near the end of a 20-kilometer climb to Torre de Chipre, in the foothills of the Andes, enabled him to depose national hero Nairo Quintana from the Oro y Paz race winner’s pink jersey. All three of those superb victories at age 21 have brought Bernal’s name to the attention of the cycling world this year. But there were earlier breakthroughs for this talented young man. One of the more important for Bernal came on two successive Sundays in Italy three years ago, when he was still in the junior category. On September 13, 2015, in the Granfondo dei Megaliti in Sicily, raced on mountain bikes, he won the rugged two-hour race solo, five minutes ahead of the first elite amateur. A week later, he lined up for his first-ever road race in Europe, a juniors-only event near Pisa, which featured multiple climbs of a steep, 700-meter-long gravel road, one of Tuscany’s strade bianche. That road gave the race its Italian name, which translates as “Dreaming of the Tour of Flanders.” Halfway through the 123-kilometer race, Bernal broke clear on the dirt climb with another rider and dropped him at the end for another outstanding win. Perhaps Bernal was always destined to be his own man. Even his birth was atypical. His mother Flor Gómez, when she was 22 and picking out perfect carnations in her job with a flower wholesaler, was distressed by her clothes suddenly becoming wet. A co-worker explained that her waters had broken and took her to the company clinic before her husband, Germán Bernal, arrived and got her to the local hospital. But, because it had a skeleton staff that day, the hospital couldn’t help and there was no ambulance to take her into the city. They scraped together enough pesos for a taxi to Bogotá, where, according to El Espectador, patients were lining the corridors in the overcrowded infirmary. By mistake, Flor was given too large a dose of pitocin to induce labor, and after delivery she was taken to the ICU—a heart problem had caused swelling and bleeding. She was eventually reunited with her husband and their baby boy—who’d already been named. When her pregnancy was first confirmed, their doctor said they should call him Egan, because he believed that “in Greek, I think it means champion.” That was good enough for the Bernal family; though, in actuality, Egan translates to “Little Fire” from the Greek, or “Young Fighter” in Gaelic. One man who recognized Bernal’s fiery potential was Italian coach Paolo Alberati, a former Giro d’Italia and mountain bike racer, who’d seen the Colombian take silver and bronze medals in the junior men’s cross-country at consecutive mountain bike worlds. Alberati, who lives in Sicily, took Bernal to the Megaliti fondo in 2015 and then tipped off the Androni-Sidermec team manager Gianni Savio before the junior road race near Pisa. “We signed him the night of that victory to a four-year contract,” Savio said. To confirm Bernal’s true potential, Savio took him to Milan for testing at the center of physiological studies run by former classics star Michele Bartoli. At age 18, Bernal scored a VO2max result of 88.8 milliliters per kilogram per minute—a higher score than Froome at a similar age and just below the 92s of multiple Tour de France winners Miguel Induráin and Greg LeMond. At 132 pounds (60 kilograms), the 5-foot-8½ (1-meter-74) Bernal clearly has a bright future in the grand tours—with a possible debut in this July’s Tour or August’s Vuelta a España. He had already penciled in his credentials by winning last year’s Tour de l’Avenir (the under-23s’ Tour de France), succeeding three other recent Colombian winners—Quintana (2010), Esteban Chaves (2011) and Miguel Ángel López (2014)—who’ve all gone on to win or podium at grand tours. And judging by Bernal’s performances in the Tour of California, he’ll be ready for whatever role Team Sky maps out for him this summer, either learning the ropes behind Froome at the Tour or taking on a leadership position at the Vuelta. Gibraltar Road is as similar a climb to Alpe d’Huez as you’ll get in California. It doesn’t have the alpine backdrop, the higher altitude or the massive crowds, but Santa Barbara’s ascent does have plenty of switchbacks and an identical average grade (8 percent)—though at 10.9 kilometers it’s 2.9 kilometers shorter than the Alpe. Even so, the combination of Henao’s tempo riding, Geoghegan Hart’s long lead-out (“immersed in the effort…to make this climb as hard as we can,” the Brit wrote in his diary) and Bernal’s winning 2-kilometer surge to the line produced a climb record of 30:02—which was 43 seconds faster than the previous mark set by Julian Alaphilippe in 2016. Bernal’s average speed of 21.76 kph would put him among the 10 fastest Alpe d’Huez climbs, all set in the late-1990s and early-2000s, and it was 0.73 kph faster than Quintana’s average speed on the Alpe at the 2015 Tour. In other words, Bernal is already a world-class climber. And like those other guys with high VO2max numbers, including Froome, Induráin and LeMond, he’s not a bad time trialist. With Sky, he has raced three time trials. He won his national TT title in February, completing a flat 25-kilometer course at an average speed of 52.265 kph, and he then won the hill-climb stage at the Tour de Romandie. His third TT was California’s stage 4 at Morgan Hill. As the race leader, Bernal was the final starter on a 34.7-kilometer course that was the longest he’d ever faced. Long time trials are the Achilles heel of most pure climbers and in this one—with rolling, winding roads in the first half and flat, straight roads thereafter—the experienced climbers just behind Bernal on GC all lost time to the Colombian. The Tour’s 2016 Best Young Rider Adam Yates conceded 13 seconds, two-time Tour King of the Mountains Rafal Majka lost 41 seconds and Vuelta stage winner Mathias Frank was 1:23 slower than Bernal. The only top-10 GC riders to go faster than Bernal were his countryman and near neighbor Dani Martínez (only 22, but in his fourth European season, now with Education First-Drapac) and BMC Racing’s van Garderen. At 29, van Garderen is realizing the potential he first showed back in 2012 when he finished fifth overall and took the Best Young Rider award at the Tour de France. In the past three seasons he has earned stage wins at the Giro d’Italia, Tour de Suisse and Volta a Catalunya, and he finished 10th overall at last September’s Vuelta a España—his best grand tour finish since taking fifth at the 2014 Tour. He showed his ambition to win a second Tour of California on Gibraltar Road, when he was the first rider to chase up to Bernal when the Colombian attacked. And though he paid for that red-zone effort, he went into the stage 4 TT with just a minute to make up on Bernal—a margin he thought was within his capabilities. Van Garderen knew he had to make one of the best efforts in his career—and he did. Setting out in exactly the right gear and quickly attaining a high cadence, the American was within a couple of seconds of his New Zealand TT specialist teammate Patrick Bevin at the intermediate split—and he bombed the rapid finale, racing as hard as he has ever raced, to beat Bevin by seven seconds and make up his one-minute deficit on Bernal, plus another 23 seconds. 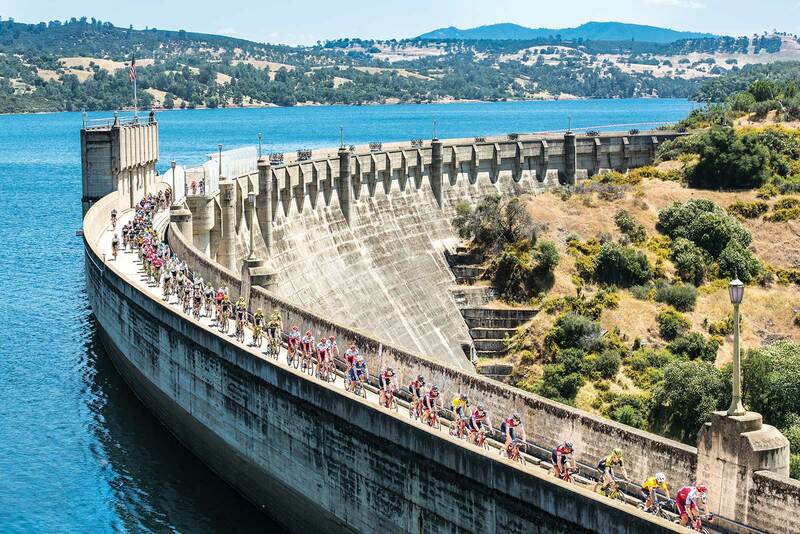 That was the lead van Garderen had to defend two days later on the stage from Folsom to South Lake Tahoe. 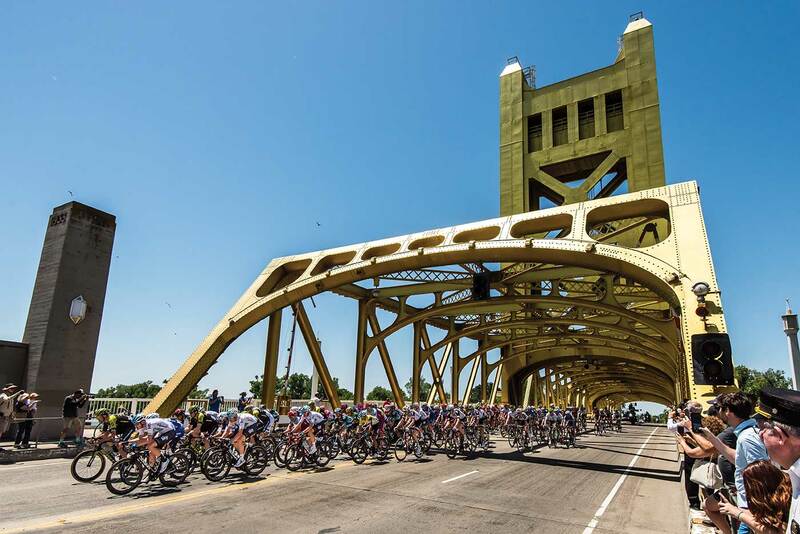 It was appropriate that the showdown between Bernal and van Garderen took place in the High Sierra, not far from where the original, one-off Tour of California had its denouement in 1971. A Mexican team dominated that eight-day race, with Sabas Cervantes winning the toughest stage into Bear Valley while overall victory went to his veteran teammate Agustin Alcántara. Forty-seven years later, some other climbers from south of the border—Bernal, Henao and Martínez—played central roles in a mountain stage that also crossed the 2,615-meter (8,579-foot) Carson Pass. The big difference between then and now was the modern style of racing. Instead of a lone rider (Cervantes) succeeding with a marathon breakaway, a nine-man group escaped early in the 196.5-kilometers stage. More than three hours and four KOMs later, following a steady tempo set by van Garderen’s BMC teammates, the peloton’s deficit was a reasonable four minutes. Then, about 55 kilometers before reaching the Daggett Summit climb, Bernal’s Team Sky, led by Welsh rider Rowe, went to the front for the next hour. They split the peloton, ate into the breakaway’s lead over Carson Pass and kept up the pressure on the 1,146-meter (3,760-foot) drop into Utah’s Carson Valley. Rowe handed over to his teammates as they began climbing the 12.7-kilometer-long haul to Daggett Summit, which has a 766-meter (2,513-foot) height differential. Although very different to Gibraltar Road, this Sierra climb is not unlike those that Bernal and Martínez train on above Bogotá: wide, smooth, few turns and a steady 6-percent grade at altitude. And, at an elevation of 2,235 meters (7,332 feet), Daggett Summit is a little higher than Colombia’s Torre de Chipre peak where Bernal out-climbed Quintana in February. Three months later, under a blazing sun, Bernal was ready to shoot for another victory. On the lower slopes, Team Sky’s high tempo cut the already-small peloton to around a dozen before Sivakov, then Henao, accelerated and reduced the group to just seven riders. Van Garderen was the only BMC man to make the cut after top helper Brent Bookwalter fell off the pace. Brief moves came from the non-dangerous Lachlan Morton and Rob Britton before Yates counterattacked. As the 25-year-old twin brother of Giro hero Simon Yates pursued his effort, only Geoghegan Hart, Bernal, van Garderen and Martínez chased. As one Brit was caught, another (Geoghegan Hart) jumped clear on the opposite side of the wide road. The yellow jersey had to respond, because the British rider was sitting in fifth overall, only 1:15 back. But before van Garderen closed the growing gap, Bernal accelerated past him to join his teammate. 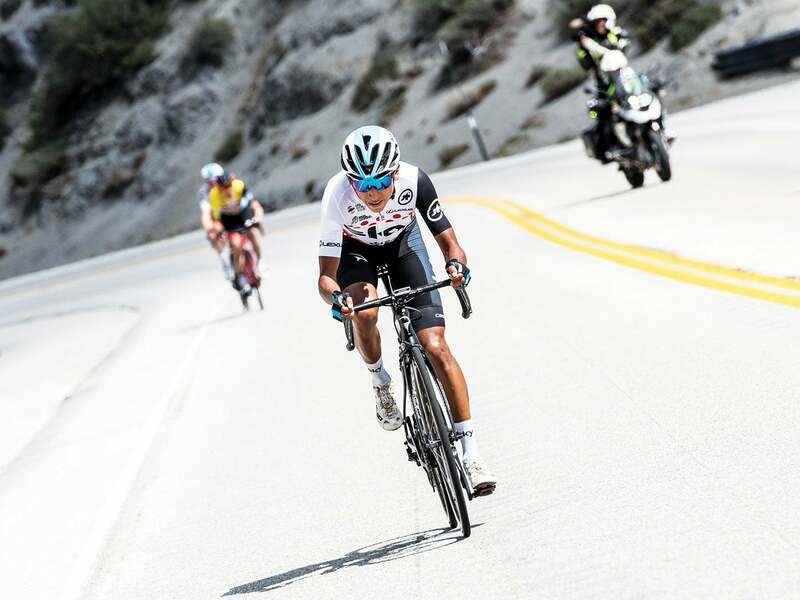 Showing good climbing form, the race leader got out of the saddle and sprinted up to the two Sky riders…but just as he joined them, Bernal stretched his legs and zoomed clear, 4.5 kilometers from the summit and 15 kilometers from the stage finish. With no teammates to help, van Garderen had to succumb to Sky’s one-two punch. The stylish Bernal took almost a minute by the summit, showed top time-trial form on the descent and comfortably climbed the Cat. 3 kicker to the line. His first UCI WorldTour stage race was in the bag. 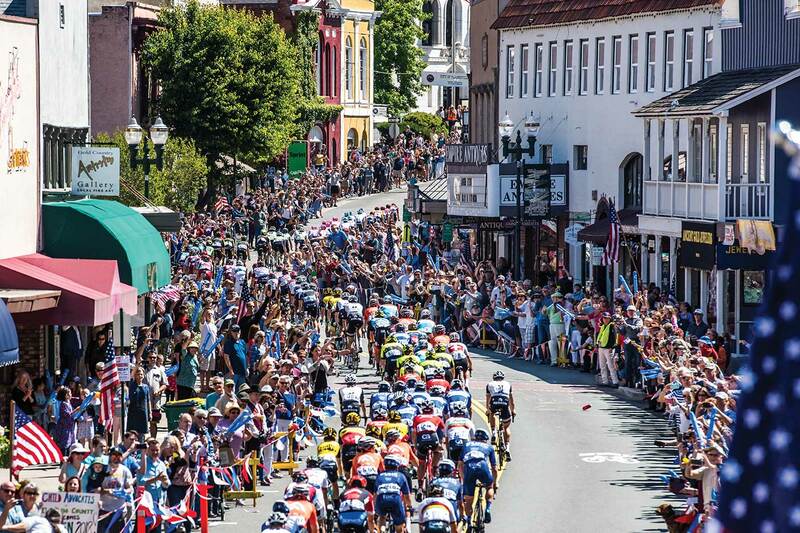 Bernal, Geoghegan Hart, van Garderen and Adam Yates will likely meet up again at the Tour de France—which is also the destination for the plethora of sprinters who came to California to hone their form. Famously, world champion Peter Sagan didn’t add to his record haul of 16 stage wins over the past eight years; he had to be content with two third places. Caleb Ewan grabbed two seconds and two thirds—including out-sprinting 30 others at Laguna Seca, but eight seconds behind stage winner Toms Skujins of Trek-Segafredo and his American breakaway partner Sean Bennett, who managed to hang on up the steep climb to the racetrack. Max Walscheid took one runner-up spot, but the other European sprinters, Mark Cavendish, Marcel Kittel and Alexander Kristoff, all came away empty-handed. 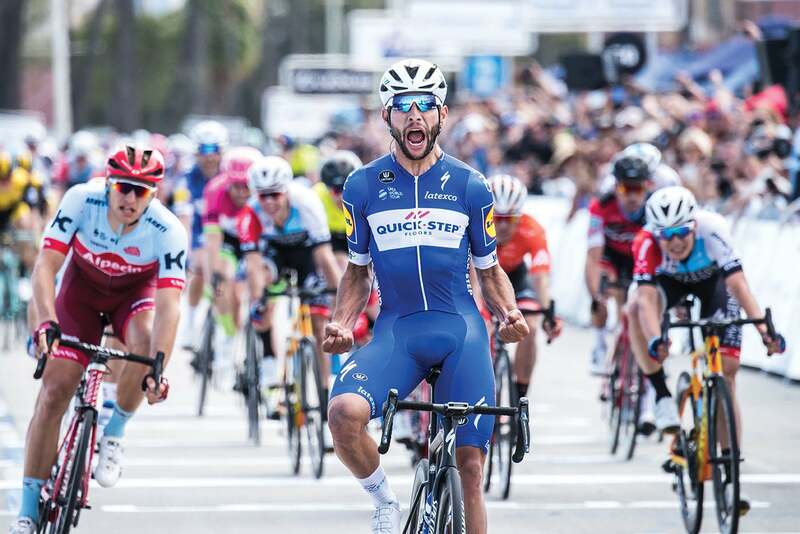 They had to watch from afar as Colombian sprinter Fernando Gaviria rode his impressive Quick-Step Floors lead-out train to clear victories at Long Beach, Elk Grove and Sacramento. While Gaviria is likely to make a big impact on the sprint stages in his Tour de France debut, his compatriot Egan “Little Fire” Bernal may well grab the headlines in the mountains. One man who’ll be willing him to success is his father, Germán Bernal, who was paid “very little” in his bike racing days but knows his oldest son is already in the big time. When Tour stages are finishing every day this July Bernal’s dad will be starting work at the Cathedral of Salt, where he’s the custodian of the chapel.